What is a Virginia Promissory Note? Virginia Promissory Note: What Is It? A Virginia promissory note is a contract between a lender and a borrower. It documents the existence of a loan between the parties as well as the borrower’s promise to repay the loan. Virginia promissory notes may be secured or unsecured. When a promissory note is secured, the lender has the legal right to a specified piece of collateral to help them recoup all or some of the balance owed. A vehicle loan is an example of a secured promissory note. An unsecured promissory note is a loan given without collateral. By signing the note, the borrower agrees to repay it. What Is a Maximum Amount of Interest That May Be Charged in Virginia? The maximum amount of interest that may be charged in Virginia is 12% if the agreement to repay is in writing. When writing a Virginia promissory note, it’s important to title it correctly. If the intent is to write a secured Virginia promissory note, the word “secured” should be used in the title. For instance, Secured Virginia Promissory Note. Without a proper title, a court may determine that the agreement is unsecured if there is a legal dispute over the document. The date the Virginia promissory note was created. This date is found under the title. It is most often written as month, day, and year. This date, and the date the document is signed, is important because it helps show when the borrower entered into the agreement to repay the loan. It also helps establish certain legal deadlines. Each party’s legal name and their role in the contract. The parties to the agreement are, primarily, the lender and the borrower. A co-signer may also be a party to the contract. If there is a co-signer, they should be listed and have their role stated. Identify each party by their legal name and their role. For example, Cat-Dog Auto Finance, Inc., Lender. Each party’s full mailing address. A full mailing address including the city / town, state, and zip code. If the promissory note is secured, it should include the borrower’s physical address if it is different than the mailing address. If there is a co-signer and the note is secured, the co-signer’s physical address should also be documented if it is different from the mailing address. The lender’s main mailing should also be listed here. The principal loan amount. This is the amount of money provided by the lender. It does not include the interest charged for the loan. Before this document is signed, this amount should be checked for accuracy. The yearly interest rate. This is the amount charged by the lender for the loan. It is expressed as a yearly figure. The most common words used are per annum or annual percentage rate. In Virginia, the highest interest rate that may be charged legally is 12%. Payment agreement. 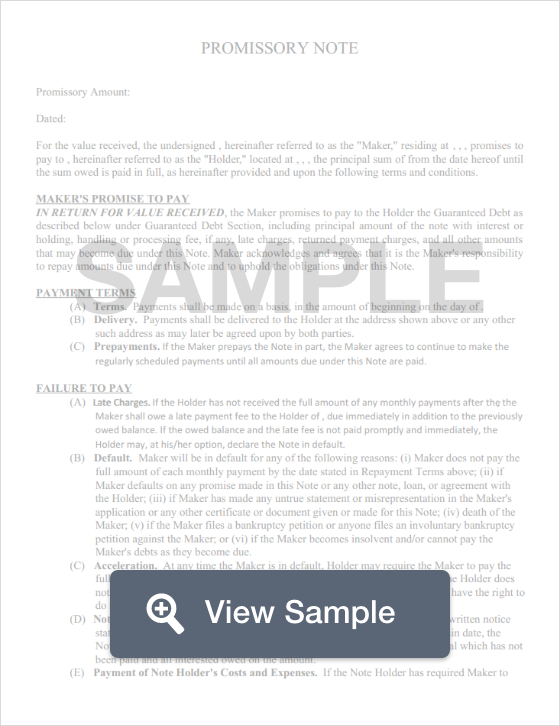 This section documents the total number of payments that must be made by the borrower, the amount of each payment, and the due date for each payment. If the lender charges a late fee, the fee amount should be documented along with when the fee is charged. The lender’s payment processing address should be listed if the lender accepts payments via mail. If the Virginia promissory note is secured, the note should include a description of the collateral the lender is entitled to if the borrower defaults on the agreement. Without this description, the lender’s right to the collateral may not be supported by the court. Interest Due in the Event of Default. This is the interest rate that the borrower will be subjected to if they default on the agreement. It is often much higher than the initial interest rate, but it may not exceed the state maximum. Payment Allocation. This clause explains how payments received are split between the principal interest and the interest. Acceleration. The purpose of this clause is to explain the lender’s right to demand immediate and full repayment of the balance because the borrower defaults on the terms of the agreement. Prepayment. A prepayment clause states whether the lender will charge a financial penalty if the borrower pays off the loan early. Attorney Fees and Costs. This clause governs how any incurred attorney fees and costs will be handled for either or both parties related to the Virginia promissory note. Waiver of Presentments. This clause explains that the lender does not have to be physically present when payments are made. Severability. A clause that states if one part of the note isn’t valid, the rest of the note will remain in effect. Conflicting Terms. A clause that explains how any conflicting terms in the promissory note will be handled to bring clarity. Notice. An explanation as to whether the lender will provide the borrower with notice if they plan to file a lawsuit because of a default. Governing Law. This clause provides the name of the state whose laws will be used to govern the agreement and any dispute related to it. Most Virginia promissory notes do not need to be notarized. If the promissory note involves real estate, it must be executed in front of a notary. The borrower must sign and date the promissory note to make it legally binding. If a co-signer is involved, they must sign and date the document to be held legally responsible if the borrower defaults.